What is Paediatric First Aid Course? This 12 hour Paediatric First Aid course is our most comprehensive paediatric first aid qualification. The course is a blend of online distance learning (6 hours) as well as a day of practical learning in the classroom with our expert instructors (6 hours). The distance learning can be completed in your own time, at your own pace, from any device. The classroom day allows students to learn the practical skills required when dealing with an emergency related to children and babies. You cannot add "Paediatric First Aid Training Course - OFSTED - Child CPR - Saturday 9th of March 2019 09:45" to the basket because the product is out of stock. Our Paediatric First aid training courses (OFSTED) is out most comprehensive Paediatric First Aid training course available and is suitable for all persons working with children at some capacity in an official setting. Our Paediatric First Aid training courses in London are approximately 12 hours long. A blend of face to face training alongside a distance learning package. We are currently using an eLearning platform to give students more flexibility by only attending for 1 day rather than 2 days. When booked onto a course you will be sent a link to an online learning platform which must be completed to gain your Paediatric First Aid course certificate. What will I be learning on a Paediatric First Aid Training – OFSTED course? It’s a fun, informative, action packed course with a mix of practical scenarios and some pre-reading to ensure you feel confident dealing with any life-threatening child and baby First Aid emergency. The highly experienced emergency service trainers will use their own real life experiences and Paediatric First Aid techniques to aid your learning. You will explore techniques to manage groups like school classes during an emergency situation and even touch on the difference between adult Emergency First Aid and Paediatric First Aid. Our Paediatric First Aid training courses are based on OFSTED guidelines. It enables learners to gain the knowledge and set of practical skills needed to deal with a range of emergency first aid situations that arise when looking after children. This Paediatric First aid training course gives delegates a thorough breakdown of common illnesses and injuries related to children and babies. It’s designed for people who commonly work with children but it’s also a very useful course for parents, grandparents or anybody else that is in regular contact with children. In fact, anyone who wants the knowledge and skills to deal with an emergency first aid situation effectively. All our trainers are current serving Fire Fighters and Paramedics with teaching qualifications and plenty of real life First aid experience. Our expert trainers will assess students whilst the course is in progression. This assessment will be through observation along with some straightforward written exercises. All students are awarded an OFSTED recognised Paediatric First Aid Certificate* which is valid for 3 years. You will also receive a first aid manual to keep. Are you looking for one of the best first aid training courses in London? Siren Training are the team to contact. We are a dedicated company who organise fun, practical and cost effective first aid training courses in London and beyond. First aid is a very important subject and we have recognised that, which is why we are incredibly devoted to providing the very best first aid training courses in London that we can. The trainers that carry out our first aid training courses in London and across the country are all very professional in their work. You will be taught by expert Emergency service trainers who the best hands on experience in first aid, so you know you are being taught by true experts who have the best practical knowledge. We have a team of over 70 instructors who carry out first aid training courses in London and across the UK and Ireland. Our instructors all come from various professional backgrounds including: Paramedics, NHS and the Armed Forces. All our instructors are very passionate about what they do and have the drive to share their knowledge with everyone. At Siren Training, we only employ the very best instructors who will make it easy for you to learn your new skills in an interesting and exciting learning environment. The main point of our first aid training courses in London is to ensure you feel confident when faced with a life threatening situation. At Siren Training, we believe everyone should have the skills and confidence to act in an emergency, which is why we carry out the best first aid training courses in London. Our training courses teach you how to cope and feel confident enough to deal with any life threatening first aid emergencies. One of the first aid training courses in London we carry out is the 1 Day Emergency First Aid at Work course. This course may be the most basic out of all the courses we offer, but still teaches you some very valuable first aid skills that will aid you if you are ever faced with a life threatening situation. This course is the most basic out of all the different first aid training courses we offer at Siren Training and helps you meet the requirements set out in the Health and Safety regulations of 1981. It is the perfect introductory course and is aimed towards individuals who work within a “low risk”/office based environment. If the student successfully completes the 20 question multiple choice exam and each student is awarded a HSE recognised certificate which is valid for 3 years. If you are interested in our first aid training courses in London, feel free to contact Siren Training today. Either give us a call on 0203 740 8088 or fill in our contact form on our website. 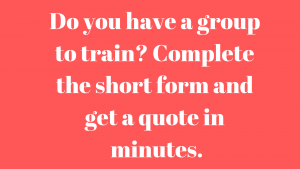 Fill in all the relevant information and one of our team will get back to you as soon as possible to discuss our different first aid training courses in London and beyond.